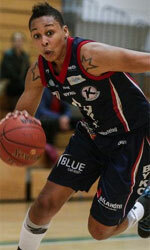 CD Adareva (LF2) re-signed 21-year old Chilean point guard Sendy Basaez (170-96). She has played there for the last two seasons. In 26 LF2 games she recorded 8.0ppg, 3.4rpg, 2.4apg and 1.4spg last season. Despite young age Basaez had impressive career. Basaez won Chilean Liga Femenina championship title in 2014. She received also Latinbasket.com All-FIBA Americas 2nd Team award in 2015. She was also a member of Chilean international program for some years. Basaez played for Chilean Senior National Team between 2013 and 2015 and previously for U18 National Team between 2012 and 2014. She also represented Chile at the ODESUR Games in Santiago (Chile) three years ago. Basaez's team won Silver and her stats at that event were 6 games: 6.7ppg, 4.0rpg, Assists-4 (3.3apg), 1.0spg, FGP: 37.0%, FT: 69.0%. Basaez has played also professionally for other Chilean teams like Los Leones, Boston College and Iquique.